Saturday September 28: Whether your a seasoned veteran or just discovering our store and the many products and services we have to offer; come down and check us out, you wont regret it. Mention our online store for a special discount. Harmony By The Bay is indeed an apt name for an event that is built on passion for art, music, food, yoga, and other artistic pursuits. On one end, you can go stage-hopping to sing and jam the night away with the best indie-pop, country, reggae, and other music fusions, in three separate stages. Over 50 vendors will make a big and dynamic marketplace that offer their wares and services ranging from mouth-watering food choice, yoga instructions, and a wide variety of artworks. The music festival is one of the highlights of this event. World renowned indie artists will lead this amazing music tour de force. The Shins, an indie-rock band from Albuquerque, New Mexico, will be a treat for the rock crowd. Jimmy Cliff, one of the forerunners of opening up reggae music to the world, crossed over to the mainstream with hits like Sitting in Limbo, You Can Get It If You Really Want, Many Rivers to Cross, and his covers of Cat Stevens Wild World and Johnny Nashs I Can See Clearly Now, will definitely be a crowd-drawer. Kimbra, a soulful indie-pop artist, is one of the most recognizable artists today. Shes the woman voice included in the worldwide smash hit Somebody That I Used To Know by Gotye. 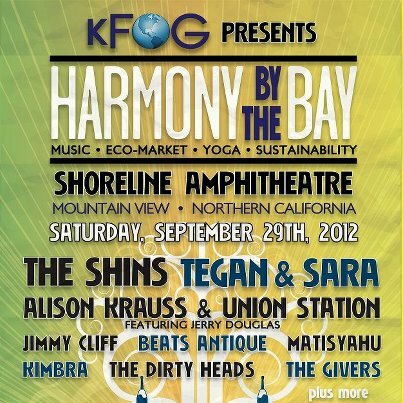 The Harmony By The Bay Music Festival also features guests performances by Tegan and Sara, Alison Krauss, Union Station, Beats Antique, Matisyahu, The Dirty Heads, The Givers, and many more. Furthur, featuring Bob Weir and Phil Lesh will rock the Shoreline Amphitheatre CA on Sunday, 30th September 2012. Furthur is a post-Jerry Garcia spin-off the Grateful Dead. 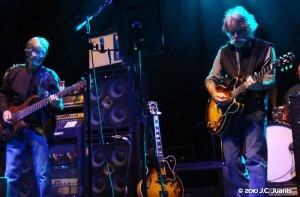 In 2009, former members of the Grateful Dead, Bob Weir and Phil Lesh re-grouped as Furthur. They are an improvisational jam band or a tribute band, whose repertoire is taken mostly from the Grateful Deads extensive and rich songbook. They perform the hits along with rarely or never-performed-live material of the Grateful Dead; they also include cover songs from their psychedic era contemporaries such as The Beatles, The Rolling Stones, Bob Dylan, and many more. Part of their set list also features their original songs, that have also been included in their live albums.